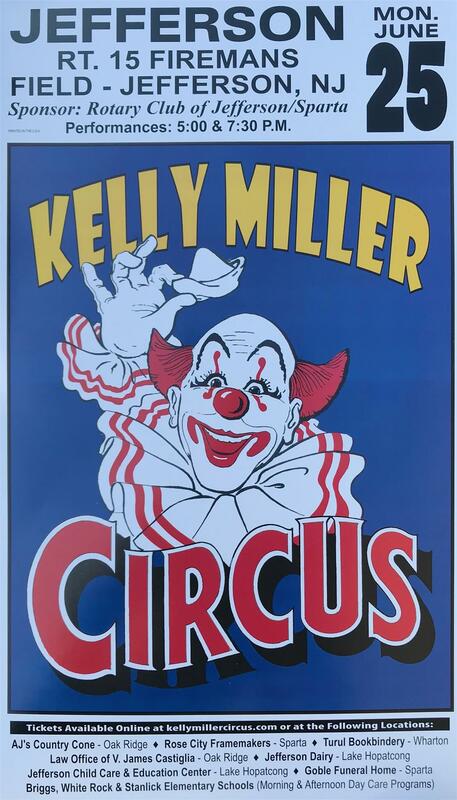 The Rotary Club of Jefferson-Sparta NJ is bringing the Kelly Miller Circus to Jefferson again this year. Two performances at 5:00 PM and 7:30 p.m. Rain or Shine. Purchases can also be made online at www.kellymillercircus.com or via Will Call at 800-334-5210. Tickets purchased in Advance are $10.00 for Adults and $7.00 for Children (Ages 2-12)/Seniors (65 and over). Tickets purchased on circus day at the Circus Box Office will be $13.00 for Adults and $8.00 for Children. Everyone is invited to come and watch the raising of the giant big top at 9 a.m.
Come out for a fun filled day and to help the Jefferson-Sparta Rotary raise money for their scholarship program for Jefferson and Sparta high school students, and for their other charitable donations and projects.